December 8, 2018 from 8:30AM - 5:00 PM. The goal of this program is to provide information, techniques,and clinical training to prepare RDHs, RDHAPs, and RDAEFs to perform the Interim Therapeutic Restoration (ITR) procedures and to prepare dentists on treatment planning and evaluation of ITRs. Our Interim Therapeutic Restoration Certification program is a 20-unit continuing education program for RDHs, RDHAPs, and RDAEFs. Directed by Dr. Paul Glassman, this blended course incorporates online, home study and in-person clinical training. Participants must register as a team with one dentist and one allied dental professional. All participants must complete all portions of the program. Allied dental professionals and dentists will complete 8 hours of online modules and complete quizzes, 2-hour webinar on November 20th from 6-8pm, laboratory assignment on a typodont in advance of December 8th and live clinical experience at the in-person session on December 8th. The online lectures can be viewed at the participant's own time. To successfully complete this program, allied dental professionals will be required to perform ITRs on at least 10 teeth on a typodont and at least 10 teeth (not 10 patients) on live patients at the in-person training. Participants are required to identify their own patients for the clinical portion of the training (additional information will be provided). Upon completion of the course, DHCC and/or DBC will be notified of participant's attendance and course completion. An allied dental professional may not perform this function until he or she has received their certificate from DHCC or DBC. Upon registration: Participants will receive program instructions and access to online didactic modules. Tuesday, November 20th from 6-8pm: Participants will participate in a 2-hour live webinar. *Attendees must recruit their own patients for this portion of the training. For individuals who do not complete the clinical portion of the training on December 8th, they will be required to complete a make-up day at an additional fee. After reviewing the online modules, each team is required to identify a minimum of 10 ITRs on live patients for the clinical training portion on Saturday, December 8th. Participants are responsible for making arrangements and communicating with their patient(s). Additional information regarding patient recruitment will be provided by November 20th. Copies of all patient health histories, consent forms and treatment plans are due before in-person training. Participants will need to supply the majority of the instruments and supplies for this course. A complete list of items will be provided upon registration. Each dentist and dental hygienist is required to provide proof of professional liability insurance for the duration of the program since they will be working on patients. A copy of the liability insurance certificate must be submitted to the Arthur A. Dugoni School of Dentistry before November 23rd. The minimum coverage of $1,000,000 per claim and $3,000,000 annual aggregate must be clearly noted on the copy of the insurance. The in-person training will take place on Saturday, December 8th at the University of Pacific, Arthur A. Dugoni School of Dentistry in San Francisco. It will be a full day training. Participants must complete online didactic training and pre-in-person laboratory training prior to participation at the in-person training. Further details will be available in Canvas, the online learning management system. 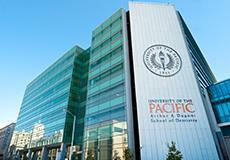 University of the Pacific, Arthur A. Dugoni School of Dentistry is one of the nation's premier dental schools and has served the Bay Area community for more than 100 years. The dental school is committed to excellence and innovation in education, research, community service and patient care. The Division of Continuing Dental Education is dedicated to educating dental professionals by providing the highest quality CE programs available in dentistry today. Registration closes on November 19, 2018. This activity is designated for 20 units of continuing education credit. Both the dentist and the allied dental professional will each receive 20 units of CE. Alan W. Budenz, MS, DDS, MBA, is professor and interim chair of diagnostic sciences at the Dugoni School of Dentistry. He has more than 35 years of general practice experience and has served as clinical group practice administrator and chair of the Department of Diagnostic and Emergency Services at Dugoni School of Dentistry. A graduate of UCSF School of Dentistry, he has extensive experience in head and neck anatomy, dissection and nerve tract identification and has lectured internationally on local anesthesia.